I had a meeting in London last week which ended at 2pm which gave me a few hours to wander off and do my own thing. 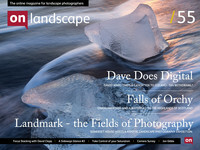 Having added a news item to On Landscape about the “Landmark - the Fields of Photography” exhibition I thought it would be a good idea to go along and report on it in person (the diligence!). I am so glad I did as this could well be the most important landscape photography exhibition to grace our shores since Bill Brandt’s “The Land”. Now you have to remember this is fine art landscape photography and just as with classical music and poetry, you might have to spend a little more time getting to know the occasional image than usual. This is far from the default case with the majority of pictures here as most of these are eminently accessible and as such I can only say that this is a must visit for all landscape photographers if you can make it. The curator, William Ewing, has divided the exhibition into ten seprate sections and I’ll talk through each section in detail below. The rooms draw you in from the pictorial/sublime of the first which segues slowly to the more experimental/political as you travel through the seventeen rooms. Fortunately the size of the exhibition means that even if it is busy, there will always be space to spend some quality time with the images. If you’re really passionate about contemporary landscape photography I would put a whole day aside. As I’m in the process of looking at printing, framing and presentation of my own images, I was particularly fascinated by the range and quality of work on show. There was a very broad representation of optical and digital wet prints and also of inkjet prints. There were some oddballs where the prints were rippling quite badly (Mr Kander! ), and overly noise-reduced, smeary prints; unglazed prints that looked wonderful; photos from 10x8 that ranged from contact printed, jewel like objects to 100”x80” enlargements that sucked you into the picture; screenshots from flickr; cut and paste 3D constructions (the last room got a bit weird). and more. Somerset House, the Positive View foundation and William Ewing should be congratulated for creating such a wonderful, eclectic cross section of contemporary landscape photography and I’ve been told that the space will be used for more and more photographic events (the Sony World Photography Awards arrive just after this exhibition). For those that are more interested in the works on show I’ve tried to give my take on the exhibition as a whole. Get to see it before April 28th!